Rental cars aren’t normally insane expensive or high-end. Sure, there are some exceptions like Hertz’s Dream Car Program where you can rent Porsche or a Ferrari for a daily hefty price. Monaco must have its standards for the rental cars set differently from the rest of the world. That is because this driver’s rental car is the red Lamborghini Aventador SV. However, in all honesty, buying a car would be a more economical solution. Nonetheless, this guy is very lucky to rent and drive around in a car as rare and powerful as this Raging Bull. Check out the video below to hear it roar around Monaco. 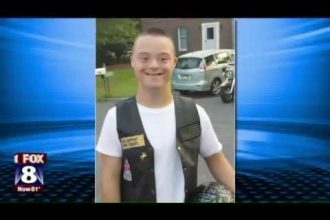 Motorcycle Club ESCORTS Boy To First Day Of High School!! !